Dietmar Glatz has a vision for the future of 3D printing. "Numerous printers will manufacture products in huge print farms to which people from all over the world will send their orders. All of the processes and all of the possible additive manufacturing materials will run simultaneously and everyone will be able to access their orders online – meaning they act as their own scheduler!” According to Glatz, this “future”, however, is long since underway. These days there are already companies in the USA, for example, where thousands of 3D systems are in operation. "Series production from printers has been around for a long time! Airbus is already installing RP components in aeroplanes. Hearing aid casings are also being printed individually as unique copies. Spectacles are now being produced by printer, 1,000, 2,000, or 3,000 units at a time," says the director of the RP Centre at Merseburg University of Applied Sciences, providing some examples. RP stands for “rapid prototyping”; "generative manufacturing" and "additive manufacturing" are other names for the technology in which three-dimensional objects are generated with the use of printers. One layer is laid over the next layer, whether the material in question is made from plastic, metal, plaster or sand. Dietmar Glatz is something of a pioneer in this technology. He has been working in the area of rapid prototyping since 1992. It was at that time that the mechanical engineer and plastic processing technician found himself fascinated by the first ever RP machine in Germany. The first component to be manufactured, which he himself withdrew from the 3D printer in 1992, was a printed plastic vacuum cleaner nozzle. Glatz tells us that the 3D system occupied the space of an entire room and that the nozzle cost some 12,500 Marks to make! The vacuum cleaner component is now kept in a showcase in the RP laboratory at Merseburg University of Applied Sciences together with other RP-related items. Many of them have been made by the students. In addition to small violins and miniature chess games the collection also includes highly refined and sophisticated components, all of which have been printed as unique objects. They also include the world-famous sculpture of Uta from Naumburg Cathedral. The life-sized sculpture was scanned on the wall and printed by Dietmar Glatz as a miniature figure true to its original material colours. Additive manufacturing is a growth market. However, the technology is still very much in its infancy. Despite the fact that in many places the processes have reached and crossed the threshold to enable series manufacturing, considerable knowledge gaps remain. Scientists from Saxony-Anhalt are working hard to close them. Dietmar Glatz, for example, doesn’t need to rack his brains to tell us where the problems are when it comes to additive manufacturing: "With the materials." Industrial customers are used to having thousands of plastic alternatives in all colours. Additive processes, however, can only offer them a dozen expensive materials. The scientists are therefore looking into alternatives to such specialist materials in order to resolve this material dilemma. At the moment, for example, Glatz is pushing ahead with a funding project at Merseburg University of Applied Sciences, where together with the Fraunhofer Institute in Halle, long fibre-reinforced printable materials are being developed that offer unprecedented levels of strength. So far, it has not been possible for the carbon fibre reinforced plastics to be used in additive manufacturing. Plastics expert Dietmar Glatz believes the level of the research and development in Saxony-Anhalt in the new growth market of additive manufacturing is in the “top third” in Germany. Merseburg University of Applied Sciences is a pioneer in the field. "This is quite simply because we began working in this area much earlier than other universities," he explains. He still doesn’t know of any professorship for generative manufacturing in Germany. In Merseburg, Glatz continues to offer a series of lectures that exclusively address the topic of additive manufacturing. At the other universities in Germany, the subject is only addressed in passing. The Rapid Prototyping Laboratory at Merseburg University of Applied Sciences is now a partner to many additive manufacturing companies in the local region. The "Merseburger Rapid Prototyping Forum" series of conferences has also been established here since 2006. The Mitteldeutsche 3D-Druck-Forum (Central Germany 3D Printing Forum) continues to bring together experts from all over Germany in Merseburg. In 2008, the Merseburg Innovation and Technology Centre (MITZ) and Merseburg University of Applied Sciences also launched a successful networking initiative for companies and research facilities in the new industrial sector. Even though the funding has now run out, thirteen network partners are continuing their ongoing collaboration as an "interest group" in the Mitteldeutsches Netzwerk Rapid Prototyping – enficos (Central Germany Rapid Prototyping Network – enficos), coordinated by MITZ. "The direct benefit to the members of the network is the consolidation and expansion of their market positions. There are also shared trade fair appearances, "says Dietmar Glatz. The companies and partners in the network come from Saxony-Anhalt, Saxony and Thuringia. 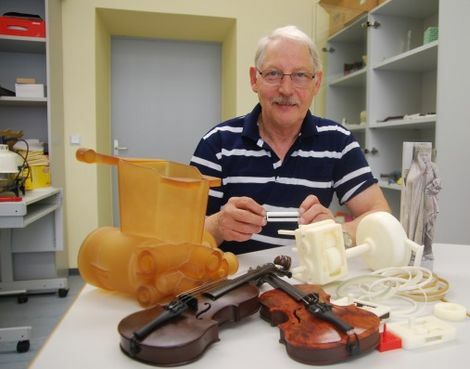 When 3D printing expert Dietmar Glatz arrived in Merseburg in 2006, his ideas were laughed at, explains the 68-year-old. This has now changed. At that time only one small system was available. Today, the sophistication of the technical RP equipment in central Germany and beyond is astounding and the position is strong. Other universities have also equipped themselves with the technology or are currently in the process of doing so – as the victory march of the printers which enable the creation of three-dimensional products continues. Additive manufacturing is the technology of the future. But for citim GmbH from Saxony-Anhalt this process, often known as “3D printing”, has long since become part of the present: This medium-sized German company with 135 employees is one of the world’s leading suppliers of additively produced metal parts.